Yaba Valley(耶馬渓) is the eastern area of Oita Prefecture. It is large site of valley that designated as the national scenic beauty. 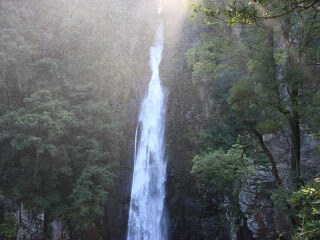 It is very popular site in Oita, and chosen as one of three unique sites and new three scenerys of Japan. The valley is formed with rocky mountains that creats the great view. The rocks are actually lava. Use Kyusyu Express Way to south. Change Oita Express Way. Exit at Kusu. Use Kyusyu Shinkansen to Kurume Station. Change to JR Kyudai Line to Bungo-Mori Station.